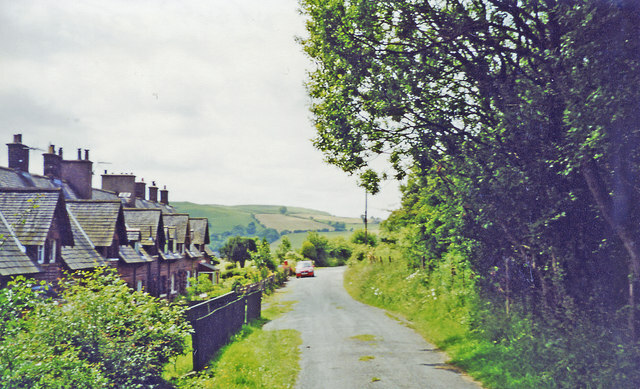 View southward in the Lune Valley, beside the station site (on the right) on the WCML (ex-LNW, Lancaster & Carlisle section), beyond which is the M6 motorway; Low Gill station closed from 7/3/60. Ahead, until finally closed 26/7/66, diverged to the left the ex-LNW 'Little North Western' branch to Ingleton, which connected with an ex-Midland branch from Clapham. Passenger services on this branch ceased from 1/2/54, goods from 1/3/65, but it was retained as a possible diversionary route a further year.